Trees serve a number of obvious purposes in the landscape such as creating shade, blocking wind, reducing noise, defining boundaries, and focal points are just a few. Deciding where to plant a tree goes beyond just creating a beautiful design. 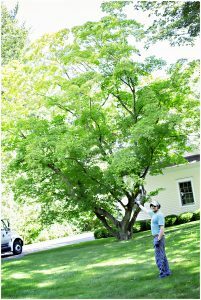 There are many other factors an arborist will take into consideration when making the best possible recommendations the types of trees to plant and how to maintain them for many years to come. Here are 10 things to consider when you are deciding what and where to plant trees on your property to save you time and money. You may want shade over designated play areas or sand boxes on your property to provide protection from the afternoon sun. However, you also may want to consider the mess that birds and other critters can cause if the canopy extends over the area. One solution to this is to map out the line of the sun during the day and place trees strategically in the path, but a distance away from the play area. This will provide the needed shade, but also keep the area clean. Keeping a pool clean can be hard enough without a tree hanging over it. And while most pools are built in sunny locations, you may want your pool to be in a spot where you can relax out of the sun. Unlike play areas, you may not want to shade the entire pool area. In this case, do not plant trees in the direct line of the sun. You can plant your tree on one side or the other to create a shady spot. Evergreen types are a great option to plant around pools. Be sure that roots will not grow and seek water too close to concrete, footings, or foundations. Roots can become very powerful and break foundations, sidewalks, paths, or walls. This can be a costly mistake. Be sure you check what’s overhead. A tree that grows into power lines can wreak havoc for you and your neighbors! Be aware of property lines and easements. This one can make enemies out of neighbors. Not only can roots grow and break pipes or lines, you also want to plant your tree in a place where it won’t have to be moved should you need to replace or repair these lines. Locate these lines and plant away from to avoid any problems in the future. Keep in mind the size of the tree. As a tree matures and reaches its full size, it should be in proportion to the size of your home. Small trees can look out of place next to a large home and large trees next to a small home can be overpowering. You’ll want to consider whether you are looking to accent your home or hide it from neighbors or the street. This will help you decide upon the size and type of the tree you choose to plant. Like the play area, parking areas give birds and other critters to make a mess! Take a look at the areas the canopy will cover if this is a concern for you. Trees will need to be cared for to maintain optimal health. This can include pruning, watering, and pest and disease prevention. An arborist can help you keep trees healthy, full, and strong so you can minimize your risk of damage and keep your property safe and enjoyable. If you’d prefer to consult an arborist, we’d be happy to help you. Give us a call at 914-238-0069 and we’ll assist you in recommending the best locations to plant trees in your yard and how best to maintain them. This entry was posted in Tips, Tree Care on October 26, 2017 by Westchester Tree Life.